ALL THE TIME GOD IS GOOD! : More objections to healing answered. More objections to healing answered. In the past few posts we have been studying healing in the finished work of Christ. We discovered that Christ's redemptive work on the cross included our physical healing. We also discovered that concentration on the experience of others' instead of God's Word robs us of hope and the exercising of His faith that's been deposited within us. Lastly, the Lord delivered a wonderful and encouraging word that reminds us we are whole in Him. That we can receive from Him because He has made us righteous and holy and totally accepted through His blood and finished work. As much as we have seen through the Word that God has provided healing in redemption, objections still arise. I want to answer two major objections with this post. In actuality these two objections often go hand and hand. So let's answer these objections with love and clarity. This is the major objection I've encountered over the years in ministering healing. Those captured by this mindset, can never fully trust God. How can I make that charge? Because, if one believes that God will do one thing today but have no guarantee that He will do the same tomorrow trust and expectation cannot exist. For instance, if today I say I will drive you home but tomorrow I say no and the day after I ignore you, would you believe I'm a reliable source of transportation? Of course not. So if God were to heal today but not tomorrow and you're not sure of next week how could you trust Him to heal you? Confident expectation in God concerning healing comes from knowing and understanding He never lies and will always do what He said He would because He is always good. In the original KJV Bible no where does the word sovereign or sovereignty even appear. From the Webster's dictionary sovereignty is defined as supreme authority. See for yourself here. There is no higher authority than God. This doesn't mean He changes from day to day because "He can do whatever He wants". Is that a good image of our Father? He is everlasting and His Word is eternal. He changes not. We can trust God to perform what His Word promises. We can trust God for healing because the Word reveals that our healing is a finished work, by His stripes we were healed. He is the supreme authority. We can see how these two objections go hand in hand. If He can do whatever He wants regardless of the Word, its inevitable that healing would then be a maybe He will and maybe He won't offer. Is this accurate? Is this true about God? I believe the Word of God reveals otherwise. Take a brief glance at the ministry of Jesus. That evening many demon-possessed people were brought to Jesus. He cast out the evil spirits with a simple command, and he healed all the sick. So these passages reveal His willingness to heal all. Has Christ changed? 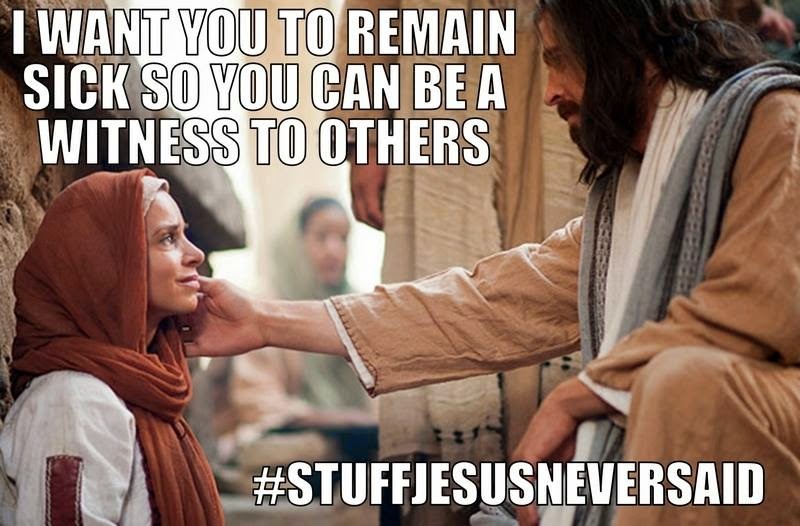 Has the gospel changed? Was the finished work an incomplete work? God stated in Hebrews that He is the same yesterday, today and forever. If Jesus willed to heal all when He walked this Earth, surely it's His will to heal all today, that would include you. Also, this was under the Old Covenant. We have a better Covenant. If He willed to heal all then how much more now that we're His adopted children? God's will is your healing. His will is your complete wholeness. He paid for it all on Calvary. Receive it, it's yours! Thanks again for taking the time to read this post. I pray the blessing of the Lord overtake you. Your comments are always welcome. I pray this post blessed you and that you consider signing up via email to keep receiving them. The Lord keep you and bless you this week. I thought about healing a lot today and then I came across your blog post. Awesome truth!! God is sooo good! He is so much better than I ever thought possible! I grew up in the church but I am just now beginning to understand just how good He is! He makes me want to dance! Yay God! Focus on the finish work and live free!